Looking for a healthy and tasty dip to jazz up snack time? Filled with antioxidants, minerals, vitamins, healthy fats, and proteins, Beet Walnut Dip is packed with amazing health benefits. Beets help detoxify the liver and protect the body from oxidative stress that often leads to aging and disease. The red beet also improves cardiovascular function and increases athletic performance due to the beet’s superhero betalains! Betalains are a group of nitrogen containing pigments found in beets and other red fruits and vegetables. These fabulous dietary nitrates are being studied as an incredible source of biological nitric oxide which helps increase blood flow. This means that when you eat beets or drink beet juice, your body’s cells receive boosted blood flow, resulting in more oxygen! High-fives for beets! In addition to the wonderful health benefits from beets, this dip contains walnuts which are high in plant based Omega-3 fats to also enhance cardiovascular function. Walnuts may also help balance weight control and improve brain function. If you don't have a nut allergy, go "nuts" for walnuts! This is my fabulous sister's favorite beet recipe, and upon waking in the morning, she heads straight to the refrigerator to eat this dip. Yes- it is THAT beetacular! Beet Walnut Dip is a favorite in our house-hold as it’s both healthy and delicious. The sweet and nutty flavor of beets and walnuts blend perfectly with garlic, tahini, and lemon juice. For extra flavor and pizzazz, add nutritional yeast for vegan “cheesy” flavor and health benefits. Nutritional yeast is a great source of Vitamin B-12, which is important to source and include in plant-based diets. Nutritional yeast may also lower cholesterol and boost immunity, so this dip is jam-packed with nutrition! 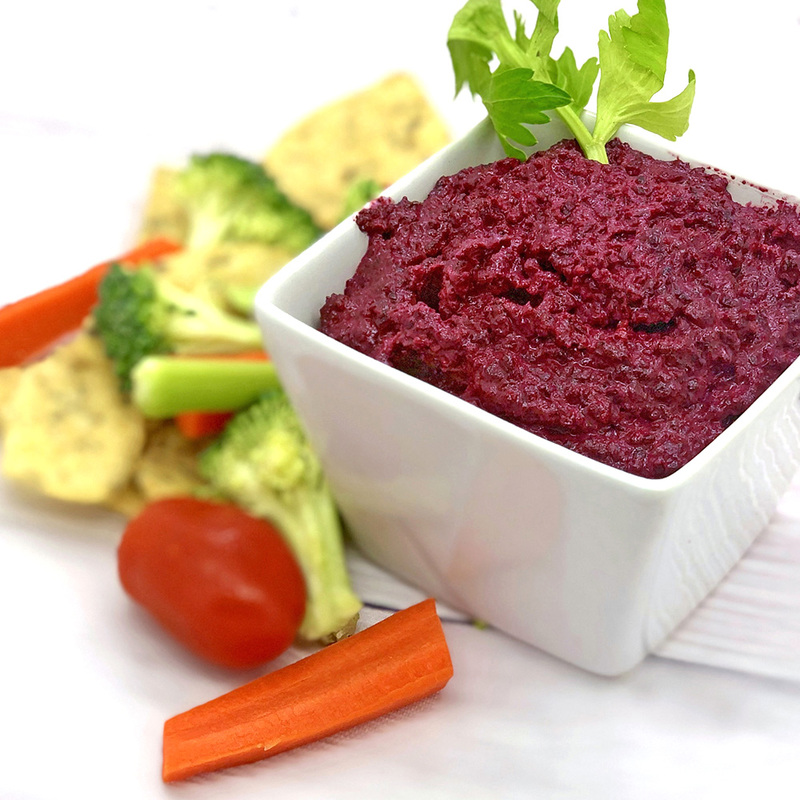 Serve Beet Walnut Dip with an array of vegetables (celery, carrots, broccoli, cauliflower, cucumbers, and tomatoes), rice crackers, or gluten-free chips. We love Late July chips that are gluten-free and filled with seeds. Scrumptious! For more tasty beetroot recipe dips, try Beetroot and Garlic Hummus (vegan), Beet Walnut Pesto (GF), and Roasted Beet and Parsnip Dip with Goat Cheese and Thyme. 1. In a small covered pot of water over high heat, bring beets to a boil, and then turn the heat down and simmer beets until they are tender, 20-45 minutes, depending on their size. If preferred, you may also steam beets for 15-20 minutes. After cooking, drain beets in a colander and run cold water over them; then relieve them of their stems and skins which should slip right off now. Beet skins are edible and nutritious, so keep skins on if you don't mind the texture. Use gloves if you want to avoid pink fingers. 2. Meanwhile, sauté the walnuts with two cloves of garlic and a little clarified grass-fed butter or coconut oil. Yum! To lightly sauté, drizzle some butter or coconut oil in a frying pan. Set temp to low. Once the pan is warm, add chopped walnuts and garlic. Sauté for about 5 minutes. 3. In a food processor fitted with a metal blade, whirl together the beets, walnuts, garlic, lemon juice, herbs and salt, stopping to scrape down the side of the bowl every now and then until the mixture looks like a coarse puree. 4. With the motor running, slowly drizzle in the olive oil, and then add tahini. 5. Taste the mixture for salt and tang, adding more salt or lemon juice as needed. Then mound mixture in a bowl or plate and serve with gluten-free crackers, veggies, or pita chips.